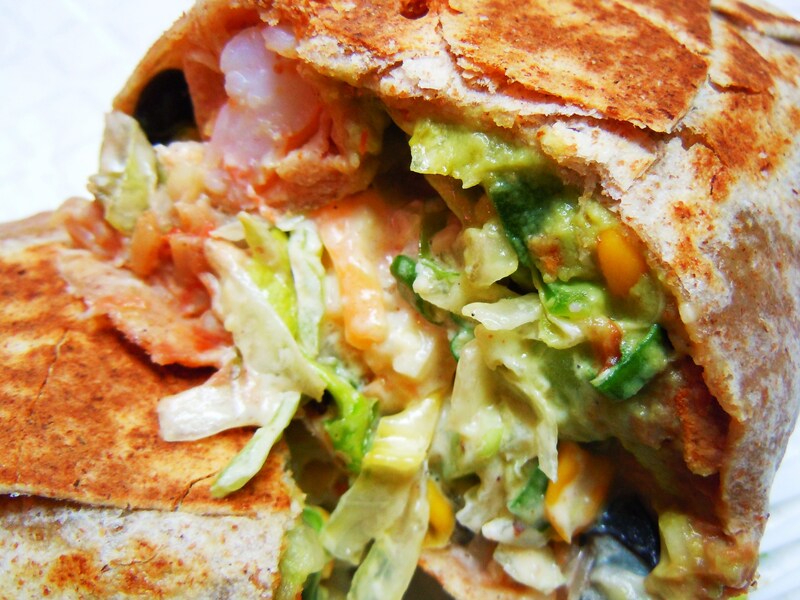 Partying Alongside Peppers, Corn, and Beans – A Spotlight on the Best Shrimp Burritos at Burrito Boyz! 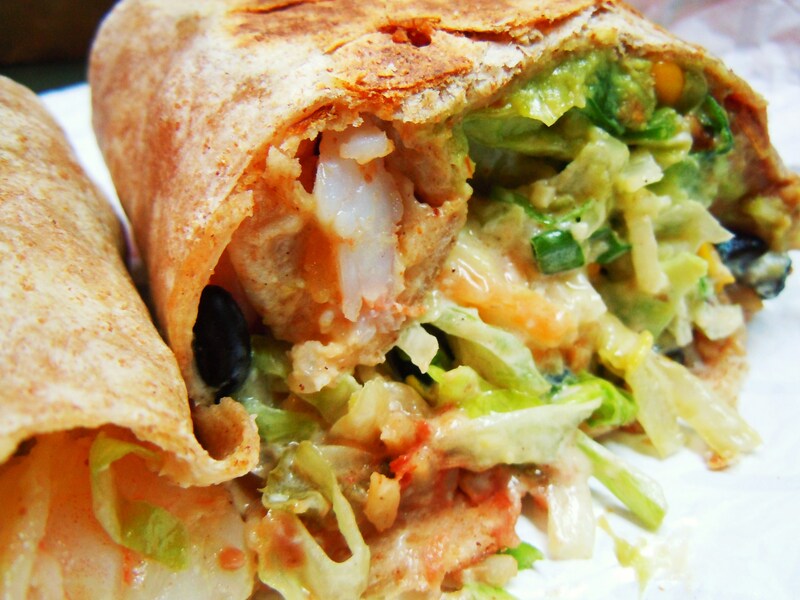 I’ve come to the realization that I just love seafood tacos and burritos (and veggie ones!) more than I love ones that have poultry or red meat in them. 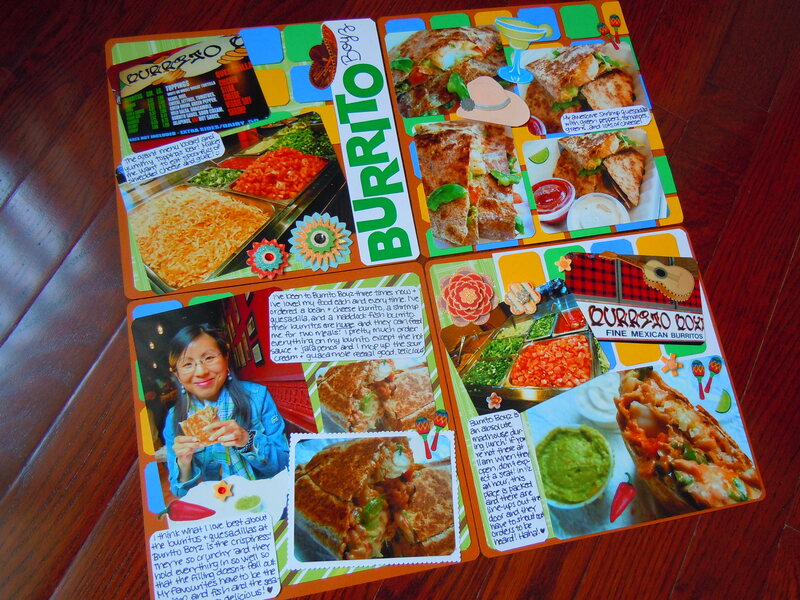 I daydream about having seared ahi tuna tacos, flaky white fish on corn tortillas with seafood sauce (or tartar sauce) and guacamole, fish with tons of beans and corn and peppers, and finally, the shrimp burritos and quesadillas from Burrito Boyz! Although I have a mega soft spot for the mind-blowingly delicious pulled pork taquitos from Tequila Sunrise just down the street on Adelaide St. West, I can’t get over how delightful the seafood burritos and quesadillas are at BB, especially the shrimp ones. If you love seafood and if you enjoy noshing on big burritos of amazing quality, you need to eat and savour the shrimp here. I love shrimp and it’s the honest to goodness truth when I say that I haver never had shrimp that tasted this wonderful, not even in dim sum! 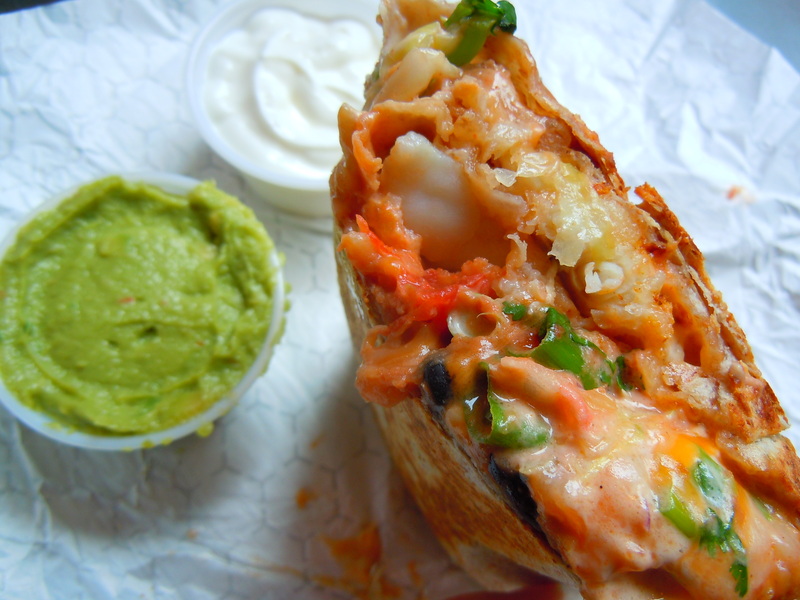 Shrimp in dim sum is heavenly, but the shrimp burritos at Burrito Boyz? Out of this world and over the moon. 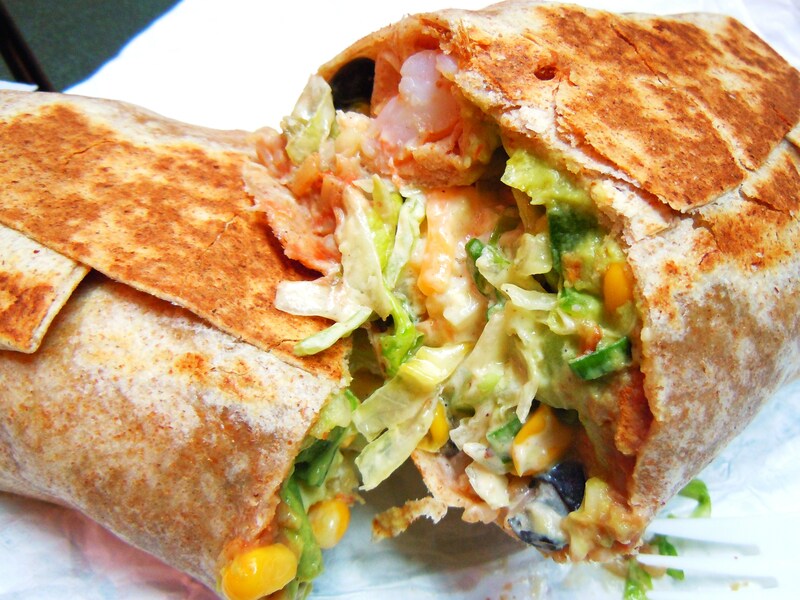 The burritos (shrimp ones are $7.08 for a small and $7.96 for a large) are stuffed with jumbo shrimps that are soft, juicy, and plump and, given how all the prices at Burrito Boyz are under $10, you really appreciate the quantity and quality of food. A large burrito could easily feed me for two meals and during my very first Burrito Boyz meal two and a half years ago, even my small veggie burrito rewarded me with leftovers to eat on the bus ride home at the end of the day! It was my lucky day – Burrito Boyz wise – the day I had this fabulous shrimp burrito because if you’re familiar with the popular eatery or if you remember the first post I made about them back in July, you’d know that crowds line up out the door for the great food here. There must have been a guardian angel looking out for me because for the first time in two and a half years, I passed by the famous T.O. burrito hole-in-the-wall, glanced through the front window, and saw several empty seats beckoning at me like blinking radars. I could not believe my eyes. There were spots to sit?! There wasn’t a line curving around the ordering and waiting area and up the stairs, out the front door?! People weren’t shouting orders at the top of their lungs so they could be heard over the chatter of the hungry?! I didn’t have to stand outside right at 11am and run inside to snag a spot?! Well, colour me shocked and ecstatic! Opportunities like this didn’t come easy (or at all, really) so I pounced and had myself one of the most delicious lunches ever. You have free reign when it comes to toppings – if you don’t like it, don’t pick it! Along with refried beans and rice, and sour cream on the side (I love dunking stuff in or spooning it on myself), I chose black beans, corn, lettuce, green peppers, green onions, guacamole, and burrito sauce to party-harty alongside the juicy, scrumptious shrimps. The combination of toppings was fantastic and I can say with absolute certainty that THIS is my favourite burrito from here! It took a few tries to hit the nail on the head, but the process leading up to uncovering my ultimate favourite was incredibly yummy and enjoyable. If every process was like this, we’d be smooth sailing. 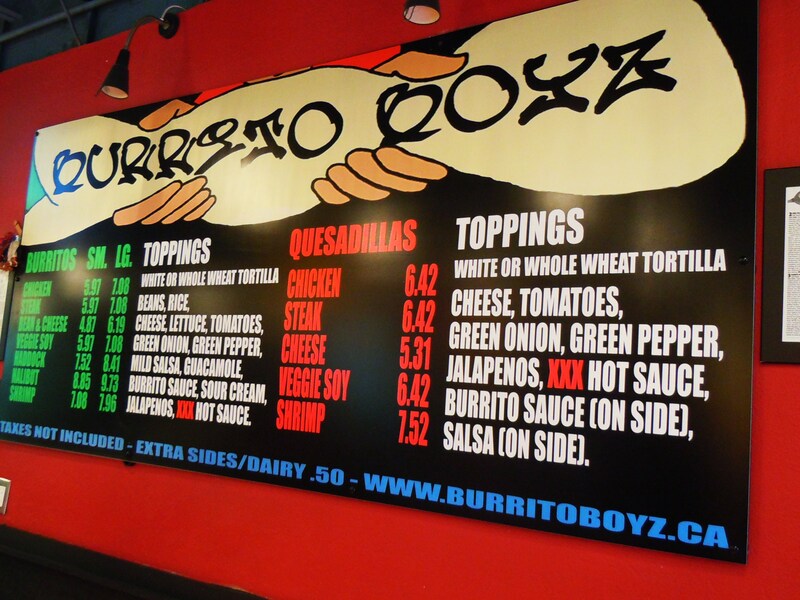 Burrito Boyz is located at 218 Adelaide St. West, west of Simcoe St. and east of Duncan St. 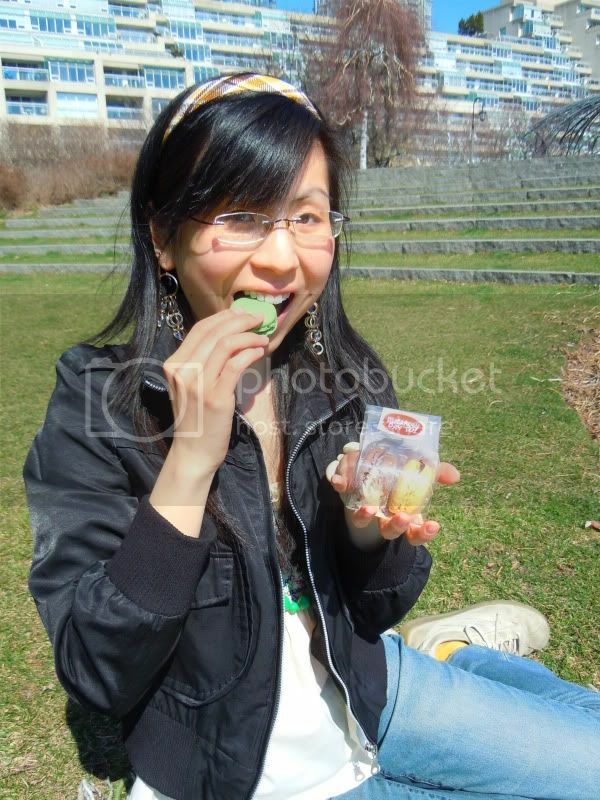 They have a number of locations in Toronto and the GTA, including Bramption, Mississauga, Streetsville, and Waterloo. Their 2nd Toronto location resides in the neighbourhood of Little Italy at 575 College St. West, just west of Manning Ave. in between Bathurst St. and Ossington Ave. For more info on their menu and other locations, click here. 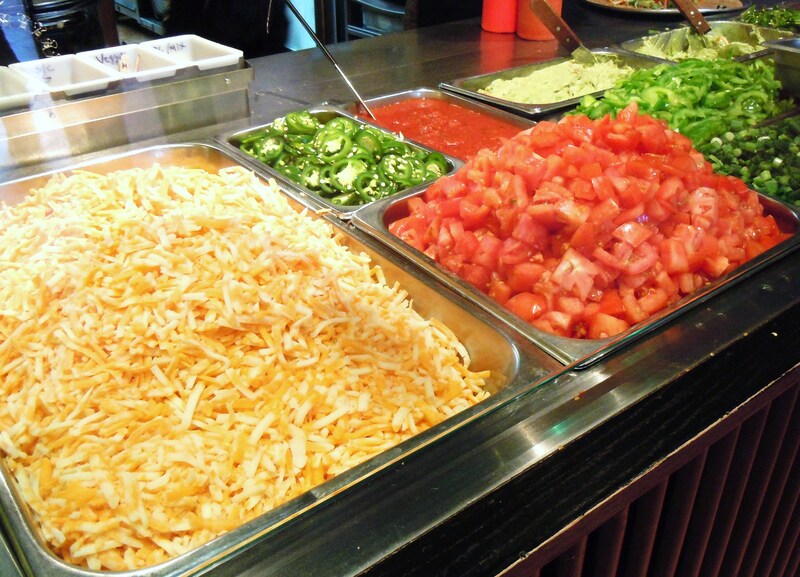 Imagine yourself in a small hole-in-the-wall place with a topping bar piled high with shredded cheese, lettuce, tomatoes, rice, beans, guacamole, sour cream, onions, jalapenos, bell peppers, and seafood sauce. The place is full to bursting with people spilling out through the restaurant’s doors and onto the steps that lead down to this popular hub-bub of Tex-Mex. There’s a buzz amongst the hungry crowd and workers need to shout out loud in order for everyone to hear them. Arms are flinging about left and right, grabbing food, making food, and by the time you know it, there isn’t an extra inch of space to sit down to eat. THIS is what it’s like at Burrito Boyz during lunch time! I can’t vouch for dinner hour, but this is the scene that has come before me every single time I’ve come here and it’s simaltaneously exciting and overwhelming! It’s exciting to see a business with great food thrive on a daily basis, but at the same time overwhelming when you’re racing against the clock to get here when they open so you can snag yourself a seat! Remember what I said in my Tequila Sunrise post? Although the atmosphere here is very “grab n’ go”, I like to stay and eat if I can which requires me to park my tooshie at this fab burrito place no later than 11:15am. After that…well, grab a number! An old friend of mine actually brought me to Burrito Boyz (the location on Adelaide St. West) almost 2 years ago and because of the crowds and my own timing, I’ve only been able to eat here about 3 times. I have enjoyed everything I’ve eaten here though and I wholeheartedly understand why this place has the business that it does. 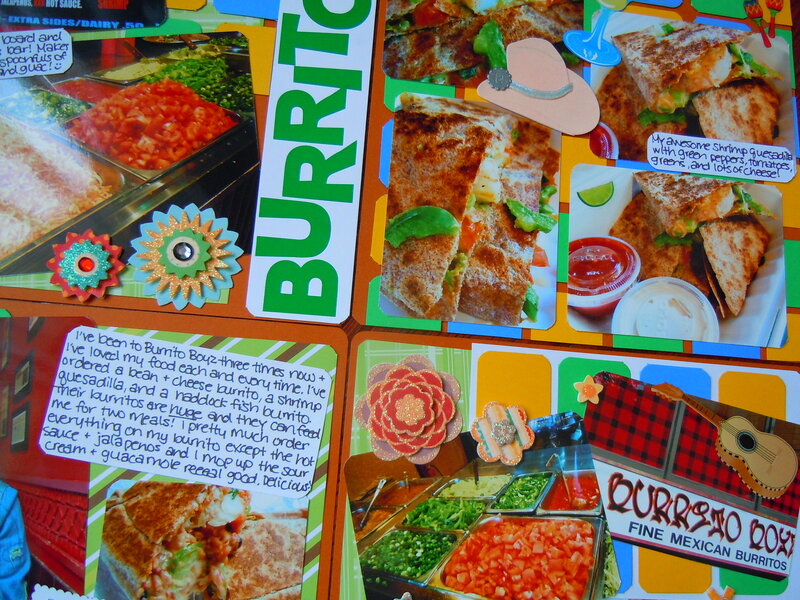 Burritos and quesadillas are their specialty and they have 7 burrito options and 5 quesadilla ones. There are two sizes of burritos (small and large) and prices for all their food range from $4.87 to $9.73. 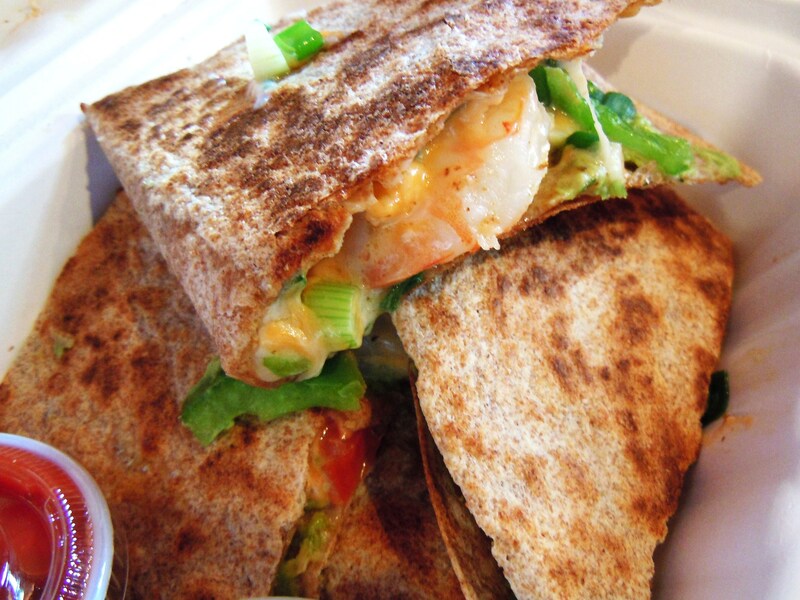 Burrito options include meat (chicken and steak), seafood (haddock, halibut, and shrimp), and veggie (veggie and cheese, and veggie soy), while quesadillas can be filled with all of the above excluding the halibut and haddock. 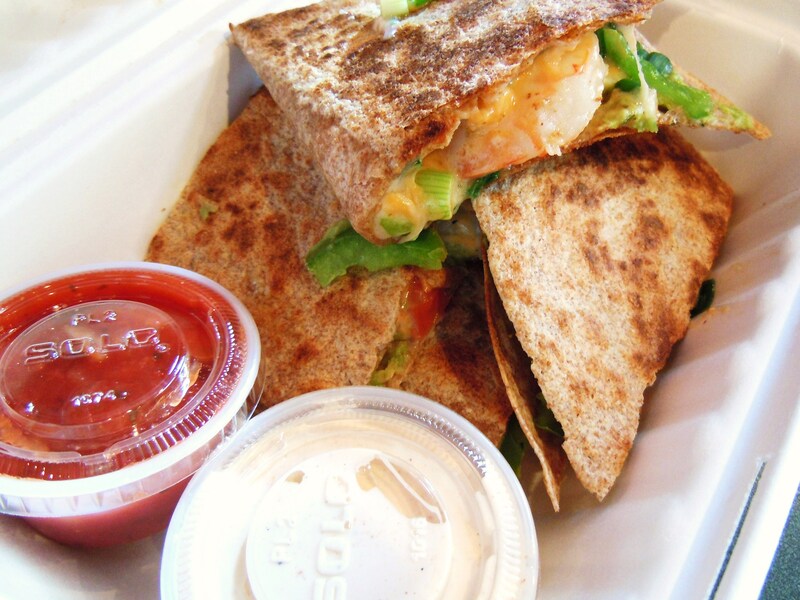 I’ve tried their veggie and cheese burrito, their shrimp quesadilla, and their haddock burrito and although I loved them all and am looking forward to trying their veggie soy, I have to say that their seafood ones totally do it for me. YUM, LOVE, YUM. 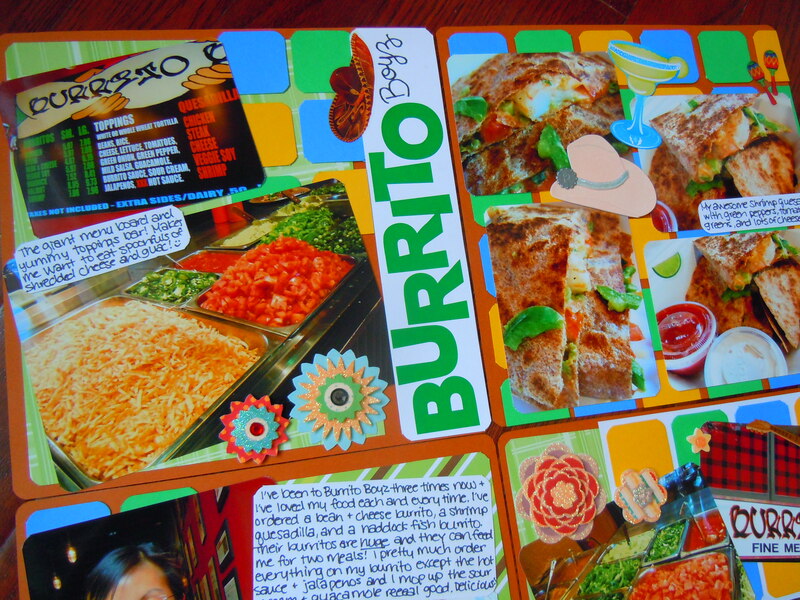 What I absolutely adore about the food at Burrito Boyz is how crunchy and crispy everything is. 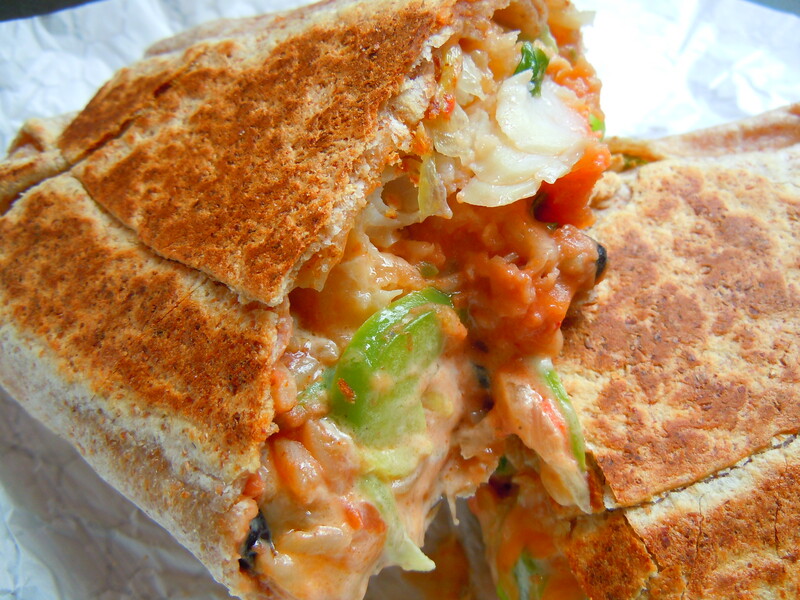 You know how burritos and such can get weighed down by the filling inside? And how the heavy filling can sometimes make the burrito soggy and fall apart thus creating a Mexican fiesta on the table, or worse, on your lap? Yeah, that doesn’t happen with the burritos or quesadillas here. If stuff falls out, it’s only because it’s stuffed to the brim with veggies and beans and rice and burrito goodness, not because of its lack of sturdiness. 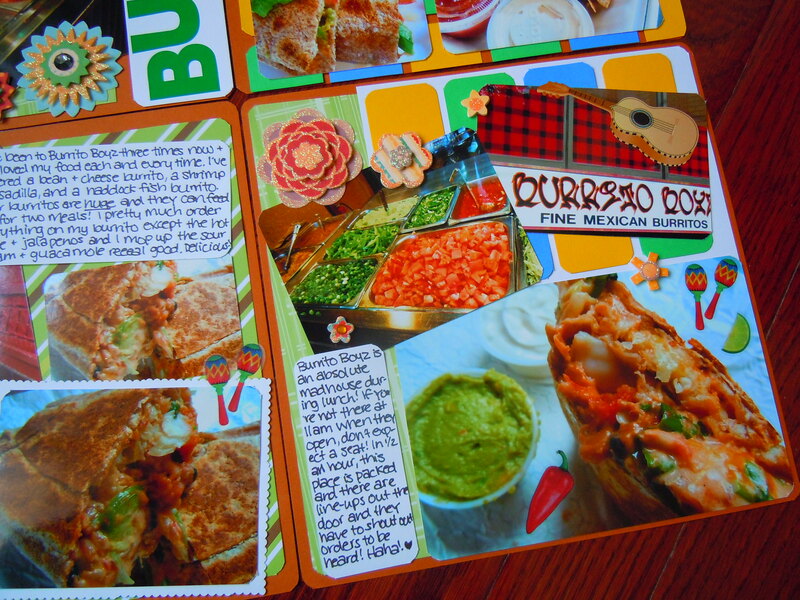 The burritos and quesadillas are pressed and toasted and the texture is fantastic. 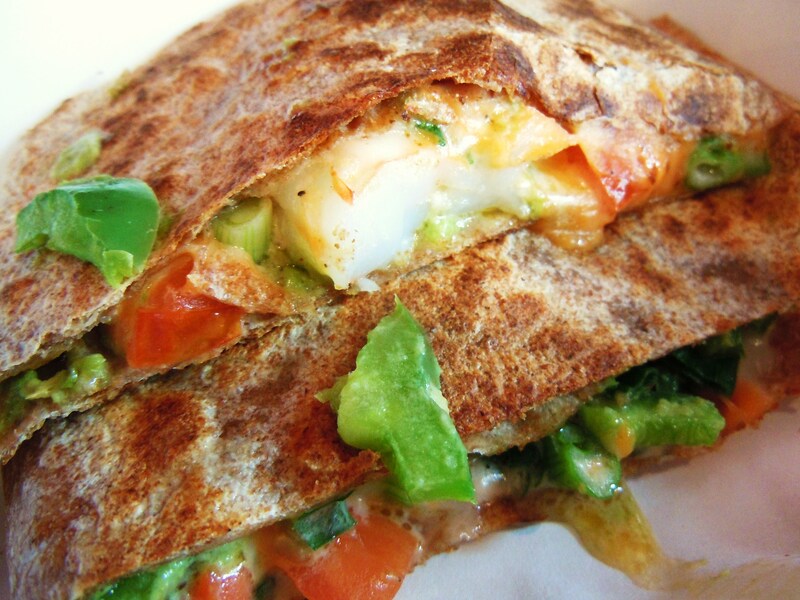 You have this sturdy toasted tortilla shell that keeps everything in, and the only word that comes to mind that can accurately describe how good the filling tastes is, “Mmmmmmm!!! 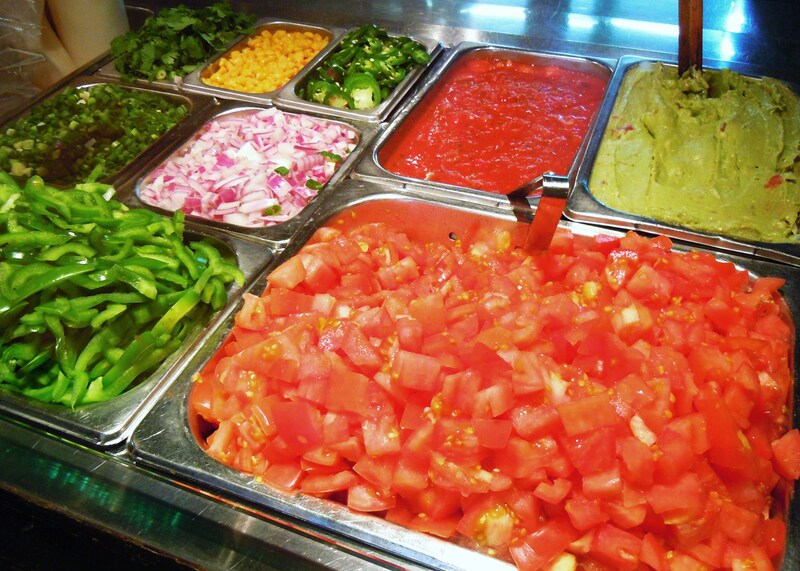 !” With the exception of hot sauce and jalapenos, I order all toppings for my food and the combination of green onions, green bell peppers, diced tomatoes, and melted cheese along with everything else is amazing. So perfectly melted and ooey and gooey. I know it seems like, “well, they’re just burritos” or “it’s just Tex-Mex type food” but that’s kind of the beauty of it. Sometimes it’s the “simplest” things that are the easiest to mess up because people can make too much of it and they muck it up with their attempt at complexity. 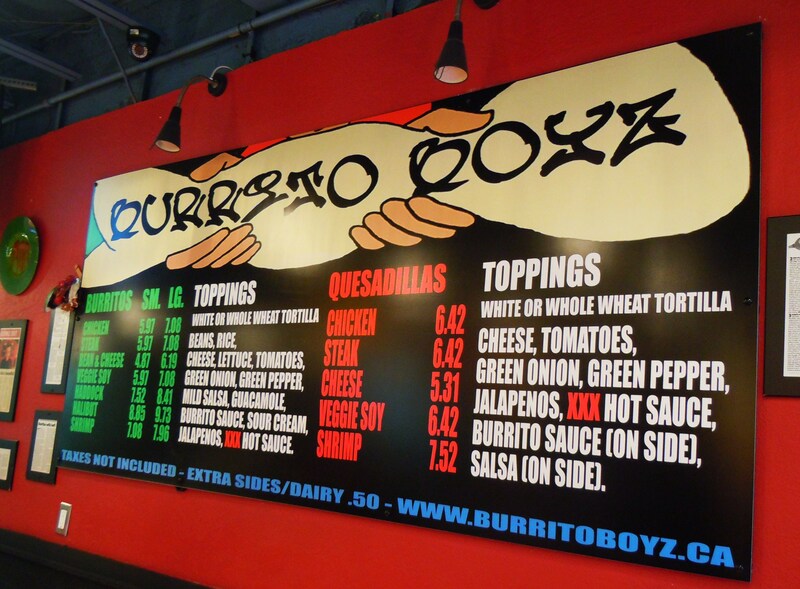 Burrito Boyz excels at what they do and I think that should be the philosophy of any restaurant business. The point isn’t to do a million things and then not do anything well. It’s better to stick to what you know you’re awesome at and let those things do the talking. It’s delicious, simple, commonplace food done right. Scrapbooking materials used: terracotta, goldenrod yellow, emerald green, cornflower blue cardstock; green patterned paper (Choco Mod Patterns by DCWV); sparkly starburst adhesive embellishments (‘Wild Saffron’ Grand Adhesions by K&Company); forest green alphabet stickers (Recollections); Mexican themed stickers (Sticko and Paper House); cowboy hat sticker (Jolee’s Boutique); corner paper rounder (ek success).